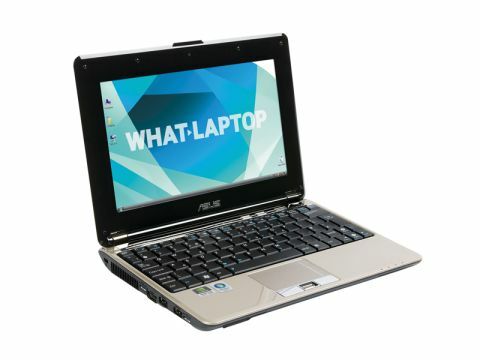 Asus' N10 is the first netbook we've seen to feature a dedicated graphics card, letting you carry out demanding 3D tasks. The latest Asus N10JH features an updated graphics card, and the ability to switch between that and an integrated GPU means you'll benefit from both power and battery life. Despite the small 10.2-inch screen, it's actually closer in size to a regular 12.1-inch ultraportable laptop. A wide bezel surrounds the display on all sides, dwarfing the screen, and it's a shame a larger panel hasn't been fitted. As it stands, the 1024 x 600-pixel resolution lags behind some of the latest netbooks, although it is a bright and vibrant screen. This machine really shines when it comes to multimedia tasks, however, with the dedicated Nvidia GeForce G 105M graphics card offering more power than many larger laptops. Coupled with the screen's low resolution, it means you'll even be able to play games. A switch on the side of the chassis lets you change to the integrated GPU when battery life is more important, with 255 minutes available away from a power point. The keyboard is good, but lacks the travel found on the best keyboards, and also rattles slightly under use. The keys could also offer more definition – making it easier to touch type, but it's still responsive and comfortable to use. The touchpad has one of the smoothest finishes we've seen, and it's easy to glide a finger across to control the cursor. Build quality is good. The shiny plastics are tough enough for daily use and, although the 1.6kg weight is quite heavy for a machine of this type, it's still light enough to take with you wherever you go. Within the chassis, the 1.66GHz Intel Atom processor struggles to run the Windows Vista operating system at full speed, even with 2GB of memory in place. It's fine when carrying out single tasks, but run a couple of applications simultaneously and there's plenty of lag. The capacious 250GB hard drive offers plenty of room for all your files, and a fingerprint scanner makes it easy to secure them. There are three USB ports for adding peripherals, with both VGA and HDMI-out ports for adding external analogue and digital displays. 802.11n Wi-Fi offers the fastest wireless connection speeds currently possible. The N10JH is a nice little product, proving stylish and well-made, with a powerful GPU. It's difficult to see who it's aimed at, however, as those wanting power are likely to be put off by the Atom processor, and those wanting a netbook may also baulk at the relatively expensive price.